It was a battle to stay out of the bottom of the NFC East and Super Bowl champions the Philadelphia Eagles escaped with an easy victory against the New York Giants. Philadelphia, playing without their star running back and a depleted secondary, put together a 34-13 win over the Giants on the back of Carton Wentz's performance on Thursday. 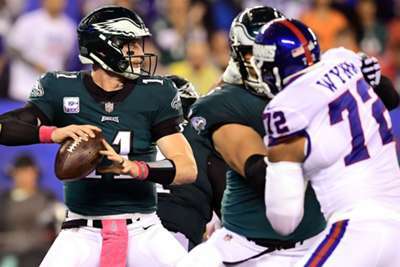 Coming off a two-point loss to the Minnesota Vikings, Wentz led the way at MetLife Stadium as the Eagles posted their first win in three games. The loss pushed the Giants to the bottom of a wide-open division, but it is one they will surely struggle in if they cannot flip the switch soon. Thursday's 13-point performance matches New York's lowest output of the season, and almost nothing — except rookie running back Saquon Barkley — was working for the home team. Was Beckham right about Manning? Many heads turned when Odell Beckham Jr.'s interview with ESPN aired. While his comments about quarterback Eli Manning appeared to be an honest reflection of what he has seen this season, many people raised their eyebrow at his delivery. Beckham may have had a point after Manning's performance against the Eagles. Manning's longest pass was two yards in the first quarter alone — two yards. He was sacked a total of four times and threw a meagre 24 of 43 for 281 yards in the game. Manning finished with one interception, which moved his total to 88 picks since 2013 — the most in the NFL. He struggled to find Beckham — whose longest reception was 12 yards — or any receiver down field. The lack of efficiency resulted in only four-of-14 third down conversions. There was concern about just how the Eagles would manage without starting running back Jay Ajayi, who was placed on injured reserve on Monday with a torn anterior cruciate ligament in his left knee. The duo of Wendell Smallwood and Corey Clement combined for a bulk of Philadelphia's yards on the ground. Smallwood had 51 yards on 18 carries and Clement ran for 43 yards on 11 carries. With Ajayi sidelined for the remainder of the season, it was a good start for a back field looking for a new face. There is no reason to wonder why the Giants selected Barkley as the second overall pick in the 2018 draft. On Thursday, he was the lifeblood of New York's offense. His two SportsCenter Top-10 worthy plays in the first half — one being a 55-yard gain after a short pass from Manning — ended with field goals. When he finally hit the end zone in the third quarter, it was too little too late. After seeing what he can do to nearly any defense, Barkley gives the one-win Giants some hope — especially when Manning is not connecting with his receivers. Barkley racked up 130 yards on just 13 carries and he contributed in the passing game, as well. Manning looked to Barkley multiple times, and the rookie ended with more than half of the team's total yards (229 out of 401).